Sonia Gandhi is one of India’s most influential women alive. I am not saying it just for effect. It is a known fact. I have always admired her as a woman, as a politician and as a spokesperson for the country at probable International forums. I love the way she has carried herself from being a foreigner to someone who is an integral part of the country today. And this is what Rani Singh’s biography brings to surface – the woman, with her strengths and flaws – all rolled in one. 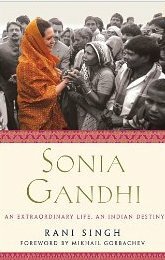 One cannot read Sonia Gandhi’s biography without being mesmerized by her. She is that sort of a lady – made of steel and yet the humane side is well-observed and documented through this biography. Rani Singh has given us a glimpse into Sonia’s life through six sections – charting her life from the Italian Girl to the Indian Household name that she has become today. Rani Singh has an acute understanding of writing a biography. She has chronicled Sonia Gandhi’s life as is – speaking of the incidents and events in a fair manner. There is no biasness involved as one would expect from an influential biography – there are empathetic moments in the book, however they do not get sentimental and that’s what holds the book together. I was personally fascinated by the read. One doesn’t know much about Sonia Gandhi besides the fact that she was the daughter-in-law of Indira Gandhi and wife to Rajiv Gandhi, both imperative to where she stands today in her career and as a woman of destiny so to speak. I got to know more about the person that Ms. Gandhi is – preserving the Gandhi legacy and at the same time trying to be the true blue, “Mother India” (by default) to India’s people. Rani Singh’s writing is not biting and neither is it boring – the book is written gracefully, and carefully examining Sonia Gandhi’s life and what it means to the Indian sub-continent. This is the first time I have ever read something on Sonia Gandhi’s life and her entrance to politics, coming from Italy to being what she is today on the map of Indian Politics. If you would like to discover more of the lady that survived the deaths of two most important people in her life and yet overcome the tragedy to being where she is today, then Sonia Gandhi by Rani Singh is the perfect book for you. I cannot recommend it enough. This entry was posted in biography, Books, macmillan, Non Fiction, Palgrave Macmillan, Review and tagged Indian Politics, indira gandhi, Palgrave Macmillan, politics, Rajiv Gandhi, Rani Singh, Sonia Gandhi on October 26, 2011 by thehungryreader.